Ah yes, making Moodle Fun. This is a VERY IMPORTANT TOPIC. The main reason is because I worked in a college for 17 years and I can say that students and staff are stressed with workload, activities and assignments. So why should they be forced to use a LMS that is boring and not user-friendly? If students and faculty members are using Moodle, then MOODLE SHOULD BE, AND MUST BE F-U-N! This topic in fact is a superb title for an iMoot or iMoot Mini presentation. I would entitle such a presentation: "Moodle: Fun and Funer". Not "Dumb and Dumber". The author of the post you referred to, Nicole Lewis, mentioned 4 main points which were themes, forums, DIY tips and tricks, security and usability. Here's my take on the topic of Fun. Some are taken from my presentation here. I believe the FUN FACTOR in Moodle needs to be CRANKED UP SEVERAL NOTCHES ON THE FUN-SCALE. Here are some suggestions and recommendations from me. I am slotting them under the 4 main headings that Nicole blogged about. 2.1 MoodleRooms has come out with the Advanced Forum mod. I find it pretty innovative. It's like a cross between an instant-message and the stock Moodle forum. The image below shows the Advanced Forum running on my Moodle 2.9.2+ site. I am using Chris Kenniburg's Pioneer theme. Simple to use, uncluttered interface. Can toggle between a text input or rich-text input via the Atto editor. 2.2 There is also Open University's ForumNG which is worth checking out. 2.3 Marginalia, the forum annotation tool. Check out my 2-year old blog post where I got it to work on Moodle 2.5. No guarantees that it will work with newer versions of Moodle. A caveat: Hyperforums is very old and no guarantees it will work with your current, modern Moodle theme. 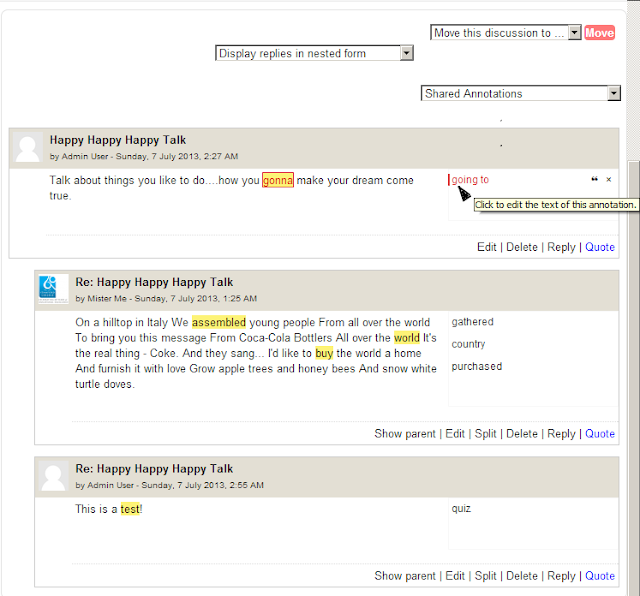 2.5 The Moodle Forum is an asynchonous texting tool. What about synchronous communication? The best Chat tool I have used (and am still using) in Moodle is VM Chat. The VM Chat developers claim that their plugin is not as resource-hungry as the stock Moodle chat activity. I have tried it on my Moodle 2.9 site, and it is a JOY to use. 3.1 The MOST FUN I have ever had using Moodle in the classroom was with Davo Smith's Real-Time Quiz. It is based on the physical Clickers concept where the teacher poses a question on the projector and students punch in their answers. Active Quiz is based on the RTQ, but it does MORE! If you want fun, (nervous) laughter, competitive spirit among students, it behooves you to give it a try. 3.3 I had tons of fun (and gave myself more work to do!) with David Mudrak's Stamp activity. I blogged about an enhancement-hack that I did some time back. You can read it here. That was just before Moodle badges were coming on the scene. When you do a mouseover pn any of the stamps, you will get a tooltip text with the name of the badge. E.g., punctuality stamp or class participation stamp. You get the idea. Related blog posts by me on the topic of Stamps are here and here. 3.4. 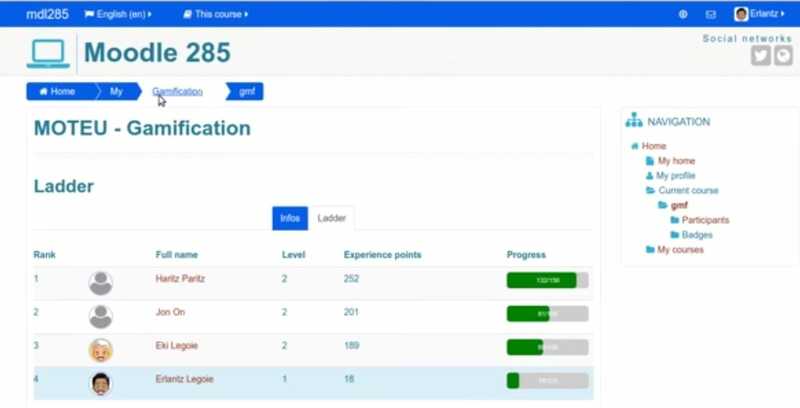 To make Moodle even MORE fun, we have Gamification with Badges and Moodle Badges. Google search for "moodle gamification" and "moodle gamification imoot". You will get lots of links to gamification resources, videos and blog posts. For example, this is interesting. Bon appetit. >upload their assignments to Moodle, .. Agreed. My mind is blank here. The Assignment activity is serious business. Nothing to contribute here. >same preferences when it comes to organization or preferred features. On your Moodle coursepage, when you click on a PDF file resource, what happens? If you use various devices to open that PDF file, is the look and feel the same? Or different? I have managed to enable PDF popups on these Moodle themes: Essential, Pioneer, BCU, Evolve-D, and Academi. Basically, you drag and drop a PDF file into a Moodle course page. Then you click on it and it opens as an PDF.js viewer inside a FancyBox or ShadowBox window. Nothing earth-shattering. But this hack works with almost all platforms (iOS, Mac, PC, Android, Linux) and devices (iPad, iPhone, Android smarphones) by displaying your PDF file content in a standardised manner, WITHOUT having to leave your Moodle page. IMHO, this pop-up thingy makes Moodle more engaging and fun. It enhances your PDF file and makes the file, that you spent so long working on, look even better on Moodle. >With the right set-up and approach, Moodle provides a useful tool for both teachers and students. >taking advantage of its many customizable management features. Lastly, making Moodle fun to use should be our priority. When Moodle becomes more fun to use, we have happier students and happier teachers. Less teachers will be resistant to technology and the walls of resistance from Dinosaur teaches will crumble. Finding a balance between functionality, usability and fun is not easy and will always be a challenge. But it can be done. It MOST be done.